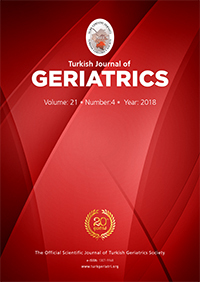 2İzmir Katip Çelebi University, Faculty of Medicine, Department of Forensic Medicine, İzmir, Turkey DOI : 10.31086/tjgeri.2018.64 Introduction: Increase in elderly population has been accompanied by traffic accident-related geriatric deaths. The aim of the present study was to evaluate the epidemiology and injury patterns of the victims. Materials and Method: A retrospective analysis of autopsies performed by the Forensic Medicine Department of Firat University in 2008-2017 was conducted. The statements of relatives of the deceased, hospital records and autopsy reports were examined. The study included 206 patients aged >65 years and who died in traffic accidents. Results: The victims comprised 75.2% males and 24.8% females (mean age 75.5±6.6 years), among which 67% were pedestrians. In 68.4% of the victims, fatal accident occurred in residential areas, among which 83.7% were pedestrians. Accidents most frequently occurred on Friday (n=54, 26.2%). In 144 (69.9%) victims, death occurred in the hospital, and the mean hospitalization length was 69.6±183.9 h. Intracranial traumatic changes were observed in 74.7% of the victims.